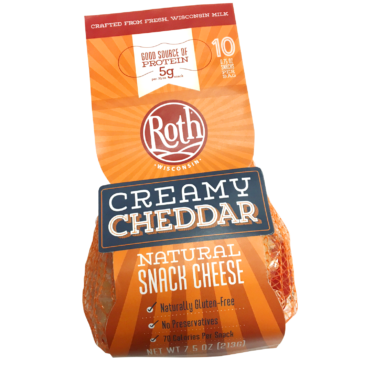 You now have permission to snack on cheese with new Roth® Snack Cheese. 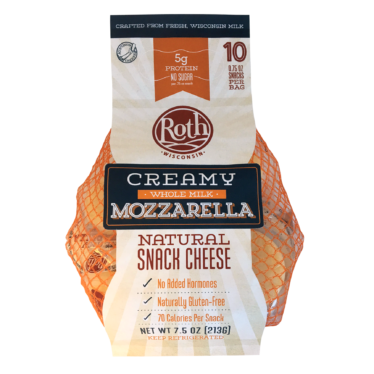 Available in three flavors, Creamy Gouda, Creamy Cheddar, and Creamy Whole Milk Mozzarella, these convenient .75 ounce snacks are perfect for kids, but you won’t mind putting them in your lunch, too. Because we care about the same things you do, Roth® Snack Cheese is always made with fresh, local Wisconsin milk. Find us in the Deli case at your local grocer. *No significant difference has been shown between milk derived from rBST-supplemented and non-rBST-supplemented cows. 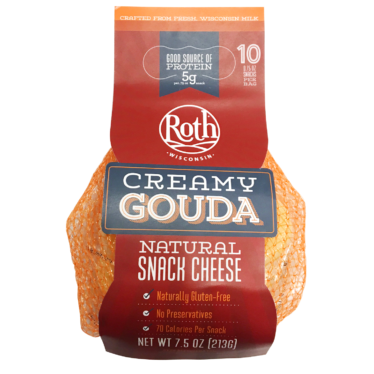 Our traditional Gouda is now available in convenient, portable snacks. Available in bags of 6 or 10, each .75 ounce snack is made with fresh, rBST-free Wisconsin milk, no preservatives, and has only 70 calories. Nutrition Facts: Serving Size .75 oz (21g), Servings Per Container: 1, Calories 70, Total Fat 5g (7% DV), Sat. Fat 3g (17% DV), Trans Fat 0g, Cholest. 15mg (6% DV), Sodium 120mg (5% DV), Total Carb. 0g (0% DV), Fiber 0g (0% DV), Sugar 0g (Includes 0g Added Sugars, 0% DV), Protein 5g, Vitamin D 0.1mcg (0% DV), Calcium 160mg (10% DV), Iron .1mg (0% DV), Potassium 16mg (0% DV). * % DV = % Daily Value. CONTAINS MILK. KEEP REFRIGERATED. The bold flavor of cheddar is now available on the go. 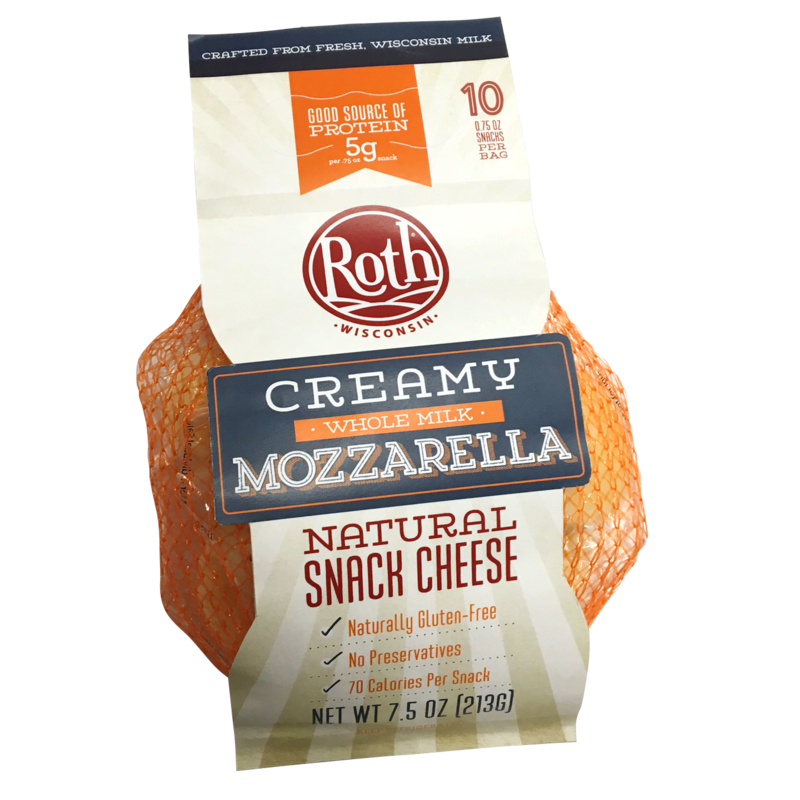 The creamiest way to enjoy your favorite snack cheese. Ingredients: Cultured pateurized milk, salt, enzymes. Nutrition Facts: Serving Size .75 oz (21g), Servings Per Container: 1, Calories 70, Total Fat 5g (7% DV), Sat. Fat 3.5g (16% DV), Trans Fat 0g, Cholest. 20mg (6% DV), Sodium 130mg (6% DV), Total Carb. <1g (0% DV), Fiber 0g (0% DV), Sugar 0g (Includes 0g Added Sugars, 0% DV), Protein 5g, Vitamin D 0.1mcg (0% DV), Calcium 121mg (10% DV), Iron 0mg (0% DV), Potassium 38mg (0% DV). * % DV = % Daily Value. CONTAINS MILK. KEEP REFRIGERATED.